The following applies to Retail customers only. Click here to view our commercial warranty. We are so confident in the quality and craftsmanship of our water ionizers that we proudly offer a limited lifetime warranty for manufacturer defects on all Chanson Water® 7 and 9 plate ionizers, and a full parts and labor 3 year warranty on our 5 and 3 plate models. Warranty is only valid for the original purchaser and for ionizers sold by Chanson Water® USA or an authorized dealer of Chanson Water® USA. 7 and 9 plate models: The limited lifetime warranty covers any and/or all defective parts on all 7 and 9 plate models for the life of the ionizer (the life of the ionizer is calculated at 10 years). For the first five (5) years all parts and labor are covered. If you experience a problem with your ionizer during the first 60 days and it was purchased from Chanson Water USA we cover ground shipping each way. 5 and 3 plate models: The warranty covers any and/or all defective parts our 5 and 3 plate models for the first 3 years. For the first three (3) years all parts and labor are covered. If you experience a problem with your ionizer during the first 60 days and it was purchased from Chanson Water USA we cover ground shipping each way. After the first 60 days, the customer is responsible for shipping both ways or may deliver it to a local authorized service center. After the first three (3) years have passed, the customer will have to pay for labor, parts and freight charges. The warranty covers all parts and labor as described above. If you experience a manufacturers defect with your ionizer during the first 60 days and it was purchased from Chanson Water USA we cover ground shipping each way. After the first 60 days, the customer is responsible for shipping both ways or may deliver it to a local authorized service center. The warranty expressly covers all failures due to defects in materials and/or workmanship; which can occur during normal use. This is a “repair or replace” warranty, Chanson Water® USA will always attempt to repair your unit, if repair is not possible Chanson Water® USA will supply a replacement unit at its discretion. Normal wear and tear is not covered under the warranty. All Chanson Water® filtration systemsare covered under our warranty. The warranty covers the filter housings, hoses and connectors. There are no exclusions to this warranty. Chanson Water USA, its manufacturer or its installers will not be responsible for subsequent damages caused by water leaks for any reason. Always be sure your water pressure and plumbing system are up to national plumbing code. Water pressure should never exceed 60 PSI. Filter replacement should never exceed 12 months. 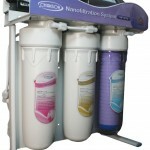 For the Chanson Nano-Filtration System there is a one year warranty on the motor and all electrical parts. When going on vacation or being away from home for any length of time it is advisable to shut water pressure to the house off. If this is not possible then shut the water supply to under sink filters off. When the installation is new check cabinet and filters for water leaks multiple times over the first week of install. Most plumbing leaks happen within the first 24 hours of install. We recommend having your filter installed by a licensed contractor. There is a leak detection device available from Chanson that will sound an alarm and shut water supply to filters off when a leak is detected, we highly recommend installing this device. Chanson USA makes no guarantees as to the performance of this device. Warranty is void if casing of the faucet or ionizer has been opened. 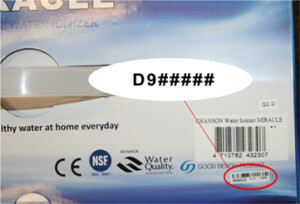 All Chanson ionizers and Chanson faucets are factory sealed. Please never attempt to service the machine yourself as this will void your warranty and could cause serious bodily harm. Damages caused by: any mis-use or abuse, such as dropping the unit or knocking into the unit with heavy objects. See our Optional Accidental Damage Plan for the latter. Damages caused by: Lighting strikes, power surges, and faulty circuitry in customer’s electrical system or acts of God. Damages caused by: commercial type usage. 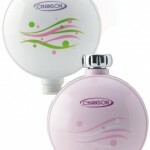 Chanson residential water ionizers are built to last however they are designed for residential use. Chanson ionizers have a 20-minute safety shut off to prevent floods from unattended use and damage to the unit. For the purpose of this Warranty, Chanson USA will consider commercial usage as; letting the machine run for more than 20 minutes at a time or for more than 4 hours a day total. (This usage is ok from time to time where special needs arise, but not as a daily routine.) If your needs will exceed these “residential” parameters please contact your dealer for “commercial use” product options. 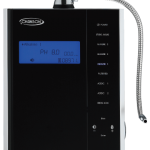 It is important to note, Chanson Water® USA does not expect residential use ionizers to fail under mild commercial uses, but cannot honor the warranty for use not intended by the manufacturer. If commercial use is needed, then consumer should choose a Chanson commercial grade ionizer such as the 9 plate Chanson Revolution, The Chanson Revolution is covered for 5 years from all manufacturer defects under commercial use. The Miracle, VS-70, Angel, Violet and Eden ionizers are all residential use products only. We are very proud to offer a maximum repair cost guarantee of $150.00 for all Chanson ionizers, which means that you will never be charged more than $150.00 labor per repair your machine after full coverage portion of the warranty has expired. We also offer lifetime free parts for our 7 and 9-plate models (5 and 3 plate models receive free parts for the first 3 years) if the parts have failed due to manufacturing defects. Customer is responsible for shipping charges to and from Chanson Water® USA. Currently the cost of this service is only $59.00 plus shipping costs. We highly recommend regular maintenance through a Chanson service/repair center because it will give you many more years of reliable service. This Warranty service is available by contacting Chanson USA or one of its authorized dealers. Customer must acquire a Return Authorization Number (RAN) and print a return receipt to include with the ionizer before shipping. And you must include the Return Instructions Form (RIF) when you send the ionizer in for repair or return. Chanson Water® also has warranty repair locations in the United Kingdom. Warranty applies to residential usage only. Due to the heavier usage in a commercial environment and the lower likelihood of proper maintenance, commercial accounts have a full 5 year warranty on the Revolution and the Revolution is only intended to be sold for commercial use. system. We recommend using a licensed plumbing professional when installing the Water Dove. for system or damage caused by fire, acts of God or freezing. beyond the recommended specs of any system voids any warranty. 10% restocking fee. Return shipping is covered by the customer. All Chanson Water® products are built to last. Housings, hoses and fittings on all pre-filters are covered by our lifetime warranty. Neither Chanson Water Inc, a USA corporation or Chanson Taiwan, a Taiwanese manufacturer makes any warranty as to damages caused by water leaks of any kind. Chanson will not be responsible for any damages caused by leaking water for any reason. This includes work done by Chanson employees or hired contractors. Always check the water pressure of your home and assure it does not exceed national plumbing code of 45 PSI. A maximum of 60 PSI is acceptable for Chanson filters. Be sure all plumbing codes in your home are up to national standards. It is a good idea to check under your sink daily and inspect for water leaks especially when the product is new. This would apply to any brand water filter. 90% of all product water leaks occur within the first 12 hours of installation, if you are not going to be home and able to check on the filters during this time, please turn the water supply to the filters off, until you will be home for 12 hours or more. Always shut the water pressure to the filter or to your entire home off when going away on vacation or even for a day trip to avoid unexpected floods. A water leak detection device is available from your Chanson supplier that will sound an alarm if water leaks are detected. Chanson does not guarantee or warrantee this product to perform and makes no claims on it whatsoever. By installing any Chanson pre-filter or water ionizer you agree to hold Chanson harmless for any water damage caused by leaking water for any reason. All orders placed before 3 pm eastern time ship within 24-48 hours if in stock.